Power pop legend Dave Rave is bringing his brand of pure hi-energy rock'n'roll to the world as prepares for an international tour in 2011 that will take him across the USA, Canada, Europe, Italy, France, Germany and more! 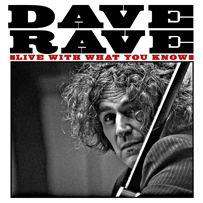 Dave's debut rock album, Live With What You Know, on the Bongo Beat label is all rock; all power pop - worthy of his unofficial moniker as Canada's Nick Lowe. Live With What You Know features an all-star cast of international musicians with members of The Trews, Plastic Heroes, Rick Andrew (The Shakers), Sonic Blue Sound Review, Mark McCarron, The Maddhatters, Gary Pig Gold and the debut of vocalist Kate MacDonald on "Silver Lines" and other artists. Dave Rave is one of the iconic pioneers of the 1977 punk explosion still active and creating as a band leader, producer, and songwriter. In the last 2 years alone he was featured on a live radio broadcast on BBC Liverpool, headlined the legendary Cavern Club, toured through France, Italy, and Germany and all in addition to a gigging schedule in the US and Canada that sees him on the road almost every day of the year. He is called the Nick Lowe of Canada and his knack for a pop hook has made him an in-demand songwriting partner for the likes of platinum selling The Trews, Jack Douglas (John Lennon, etc), John Wesley Harding, Jon Tiven, Alex Chilton, Lauren Agnelli (Washington Squares), Billy Ficca (Television) and other artists spanning all musical genres. Dave Rave approached this new album as a journey. Dave's original journey began at Grant Avenue studio where he began his career with Daniel Lanois at the helm. This album brought Dave back to Grant Avenue to work with one of its brightest lights, Amy King. The journey continued on to New Jersey where he got reacquainted with Gary Pig Gold and John Huelbig (Paul Simon). It was then on to England and the new groove of the Plastic Heroes followed by a trip to Paris to capture the wild drums of Christophe DesChamps (Celine Dion, Vince Taylor). Then it was Niagara Falls and the Maddhatters, who recently played with Bruce Springsteen. At Barn Studios in the country, Dave rocked with The Trews. Returning to New York, Dave Rave recorded with producer/songwriter Michael Mazzarella (The Rooks) and Sonic Blue Sound Review, a group of New York pop allstars, and then headed over to Long Island to work with long time collaborator Mark McCarron. To complete the circle, Dave reunited with fellow Shaker, Rick Andrew (Dave's first band was the acclaimed popabilly Shakers). Dave Rave debuted his new album with an all-star showcase at SXSW Austin, Texas, and continues to tour through the US, UK, Italy, France, Germany and Canada. Often referred to as either "the Canadian Nick Lowe" or simply "a musician's musician", Ontario native DAVE RAVE has been big news in his Canadian homeland for over three decades now. Much of his rep rests on his spells with hugely successful garage rockers Teenage Head and his own power pop alchemists The Shakers, but his CV is truly staggering. His solo catalogue includes fantastic albums like Everyday Magic and the 'lost' album Valentino's Pirates which was originally released on vinyl by the Russian (!) label Melodiya before ending up out of print (and growing in legendary status by the day) for a decade. Running parallel to these releases has been Rave's career as a much in-demand session musician with his credits including work with the likes of Daniel Lanois, Andrew Loog Oldham, Steve Wynn and Alex Chilton. With this in mind, it's perhaps not surprising that his long-awaited new album Live With What You Know has had something of a global incubation, with the songs coming from sessions in London, Paris, New York and Dave's native Hamilton and support being provided by a cast of thousands including long-term acolytes such as Gary Pig Gold, Mark McCarron, The Trews and fellow ex-Shaker Rick Andrew.